And this pink and grey one has been getting pinned like crazy on Pinterest even one pin by Lori Holt. This is her fabric line that I am using. Really weird because I am just a small time blogger doing this to amuse myself and keep focused on my art while working a very demanding job in retail. My therapy as it were. 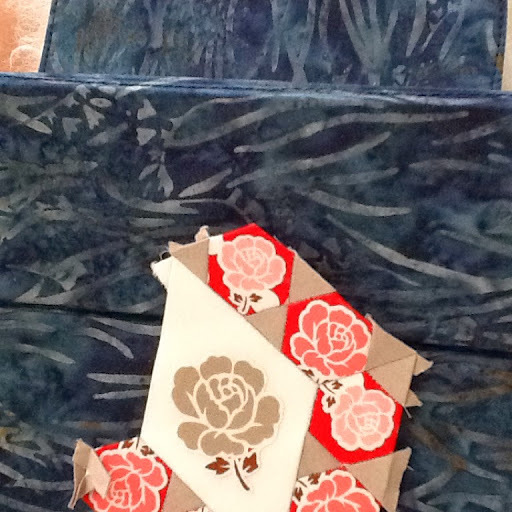 This one has a bit of bleeding from the printed lines on the template but it will wash out on the final quilt. This is the current WIP.....I started using glue stick to fold over the edges but that not be good for long term projects. We will see. You can see all my blocks on my Flickr page. Here. Wow ! 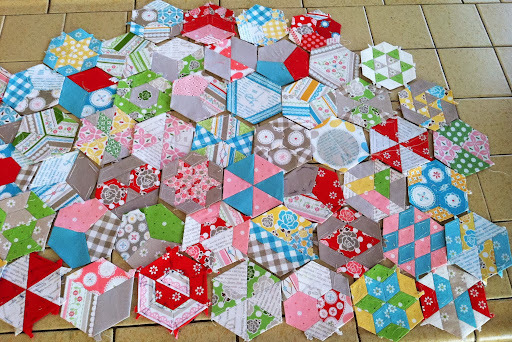 Those hexies are fabulous! 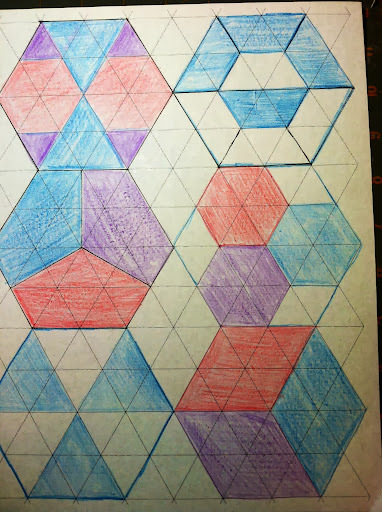 can you tell me the final size of the hexagon ? They are 2" on one side. I love your hexies. 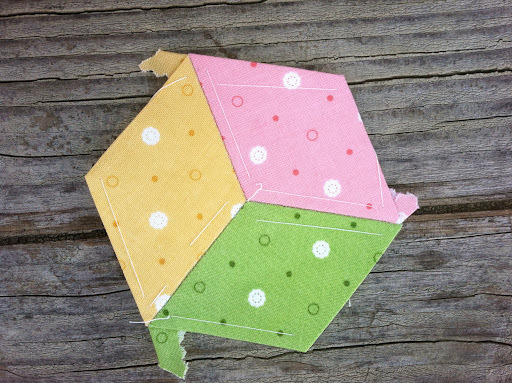 Once I finish my current EPP project I think I would be into making some pieced hexies similar to yours. I knew you had some good stuff going! It's great to see some of the individual blocks. You're right about them getting complex. They're amazing! I feel the same way about my EPP and posting it. Its fun for me, but maybe not so interesting for others since I'm using just one block style and all the same fabrics. You, however have lots if variety going here. Love it! Thanks for linking up with In Hand. 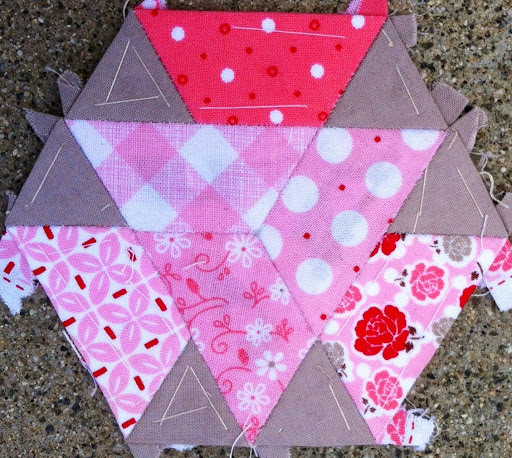 You have some gorgeous hexies and rather tiny piecing there! 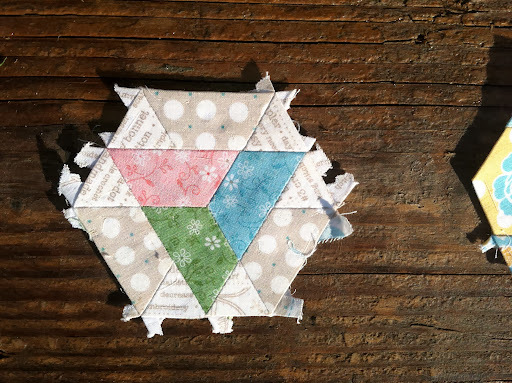 I think I remember making a few of these for you :) This is going to be a fabulous quilt! I love to see the complex blocks. I have left the more difficult ones for the end, when I feel more comfortable doing them. I am doing easy ones first. This is amazing! 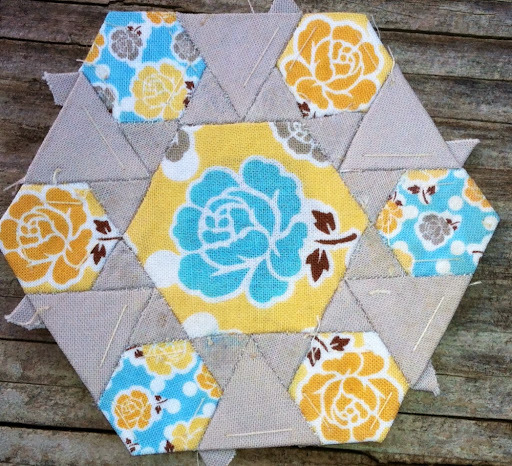 I love the different variations on the hexagon you are creating. The colors are super fun too!